Now that Jeff has left his job, there is a new district manager at Cloud 9, and she wants to save money and make some cuts. The episode begins with the arrival of the new district manager, and there are some funny lines about the fact that she is a woman, and how Glenn is uncomfortable about that, and how some employees feel differently about her because of it. The district manager asks Amy about a lot of the employees, and she discovers that the reason she is asking her this is so she can find out who to fire. Myrtle, it turns out, costs the store a lot, and when Amy shares that she isn't a very good employee, Glenn is asked to fire her. When Amy finds out that Myrtle is going to get fired because of what she said, her and Jonah work to find other ways that the store could save money so that they can keep Myrtle. Amy is very funny as she gets excited about savings, and the two prepare a presentation, which is very funny in how awkward it is, and in how Amy hates a joke that Jonah loves. The two also show their great chemistry here; while I frequently complain about the will they won't they story, America Ferrera and Ben Feldman have great chemistry. In the end, Myrtle still gets fired, which made this story have an unpredictable ending. When Glenn is asked to fire Myrtle, he struggles with doing so, and decides he wants to make Myrtle's last day a great one before she leaves. It's very funny when he tries to find out what a perfect day for her would be, and all of her answers involve spending time with her late husband, as well as when he tries to make her day great by having a local weatherman come to the store, but he turns out to be from a different channel than the one she watches. In the end, Glenn finds something that would make Myrtle's day when he lets her drive a truck, but she hilariously turns out to be terrible at it, as one would expect. With the district manager around, Mateo decides that he needs to improve his skills at the register. When he is unable to, Garrett encourages him to go onto Glenn's computer and change his numbers. It is very funny as Mateo closes the blinds, worried about getting caught, and the two view the other tabs that Glenn has open on his computer. After the district manager sees the incredibly high numbers that Mateo has (121, not 120, to not be suspicious), she has him demonstrate for others. His attempts to not demonstrate are hilarious, especially his last resort of pretending that there are bees stinging him. This was a very full episode, and I almost forgot to write about Dina. She wasn't the funniest this week, but she had her moments in her own small story, as she attempted to hide her pregnancy from the district manager. Why? Because she's Dina. As she explains to Glenn, when she finds out someone's pregnant, she thinks about all of the bathroom breaks and doctor visits. There's also a funny moment when she worries Glenn, explaining that there's always the possibility of a miscarriage, and that she lives in a neighborhood that isn't so safe. This was a strong Superstore episode, with no focus on the romantic relationships, funny moments all around, and giving Myrtle a chance to shine. 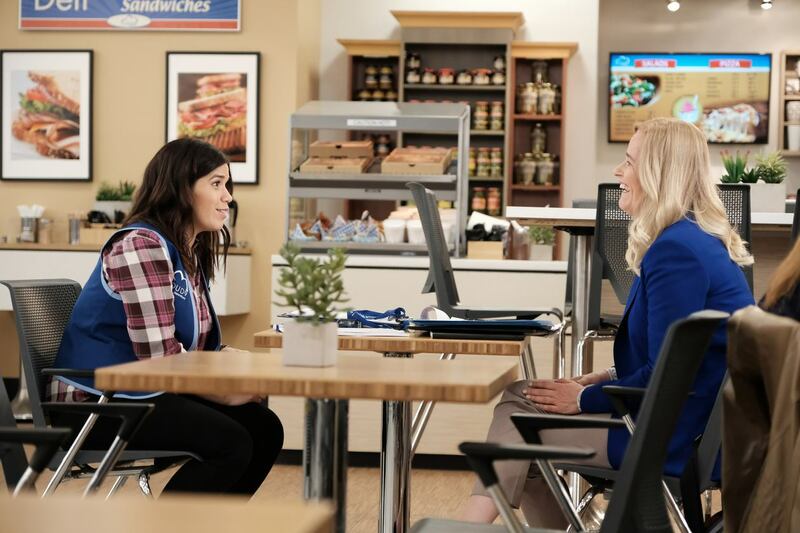 I haven't been as impressed with this season of Superstore as I have the previous two, but this episode shows that the show can still deliver. What did you think of "District Manager"? Leave your thoughts in the comments!